Bouquets of ferns, angelica blossoms and harebells sway gently alongside slender violets, delicate roses and strawberries with their jagged leaves. 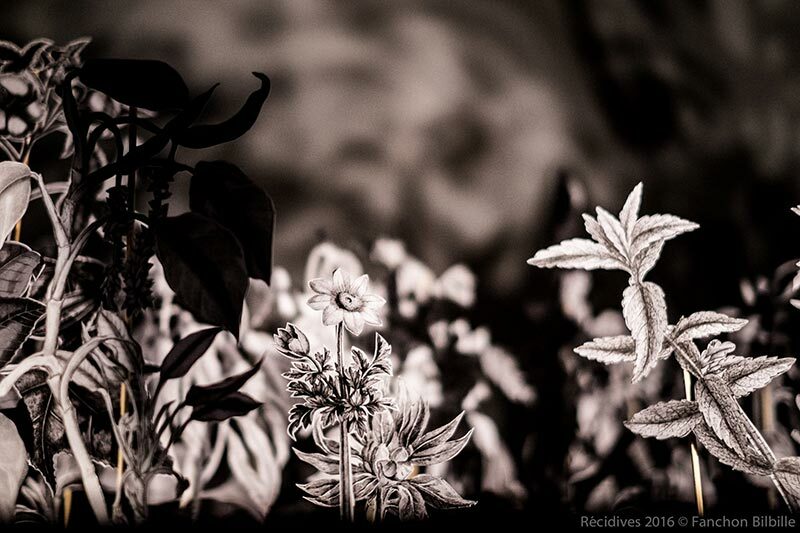 This flowerbed of wonders emerges before our eyes …in black and white and on paper. The beauty of the form of each plant surprises the visitor, while the changing lights and a soundtrack create the illusion of a garden without seasons, quivering in a light breeze. These drawings are from prints in an 18th-century botanical encyclopaedia. Benoît Faivre and Tommy Laszlo staged the drawings by copying and cutting them out, using their simple and meticulous technique for ‘augmenting’ paper. This fragile, living and ephemeral tableau is an invitation to contemplate, to marvel at nature and at the highly delicate work of a scientist from the Age of Enlightenment. Benoît Faivre and Tommy Laszlo discovered various volumes of L’Histoire du Règne Végétal [History of the Plant Kingdom] by Pierre-Joseph Buc’hoz, a lawyer, doctor and botanist from Lorraine, in the archives of the city of Metz. They were won over by the delicate prints in this unique encyclopaedia, containing thousands of plants. The author had a gigantic ambition: to present ‘all the plants growing on the earth’s surface’! The first volume appeared in 1772, but the project was never completed. These fragile publications were destined to remain in storage, with only a digital format available to the public. 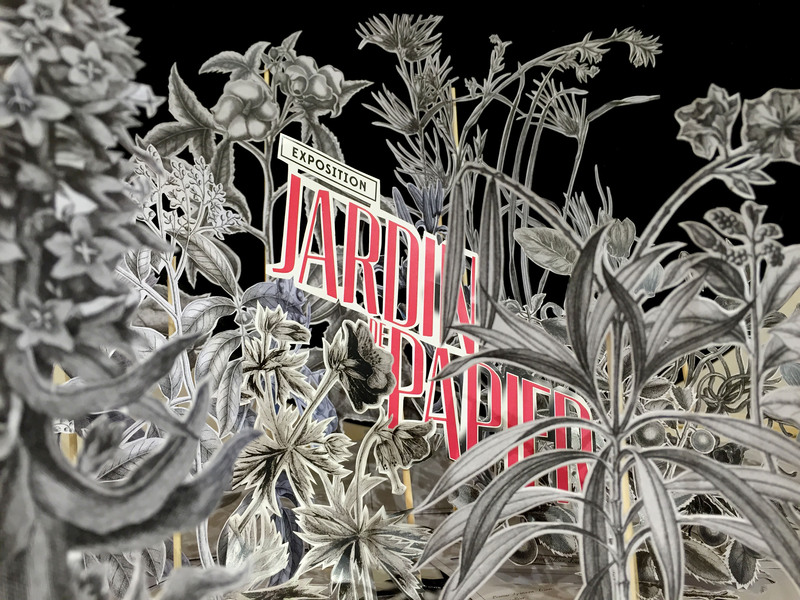 The artists wanted to make this graphic heritage accessible by creating a ‘paper garden’. The end result allows us to admire the whole book, in a type of ‘blown-up’ three-dimensional format. All the pages, and each side of every page are gathered together like a large bouquet. The Paper Garden installation originated from the research carried out by Benoît Faivre and Tommy Laszlo on ways to ‘augment’ paper documents. Their method, developed in 2014, consists in cutting out a print and ‘lifting’ it vertically, without touching the original, of course. By accumulating prints, they create a ‘forest’ of pages on which we can still read the captions indicating the name of the species. The whole display is magnified by a changing light reminiscent of the successive positions of the sun, thanks to lamps fitted to a mobile device. The sounds of nature are recreated from rustling paper and are broadcast by small mobile loudspeakers inside the tables. This backdrop of sound and light transfigures the motionless paper. The changing shadows and insect noises turn this black and white garden into a haven of peace, a condensed version of living nature. It feels so real that like certain spectators, you will want to explore it barefoot!